The church you see above is St. Cyprian’s Episcopal which was dedicated in 1876. 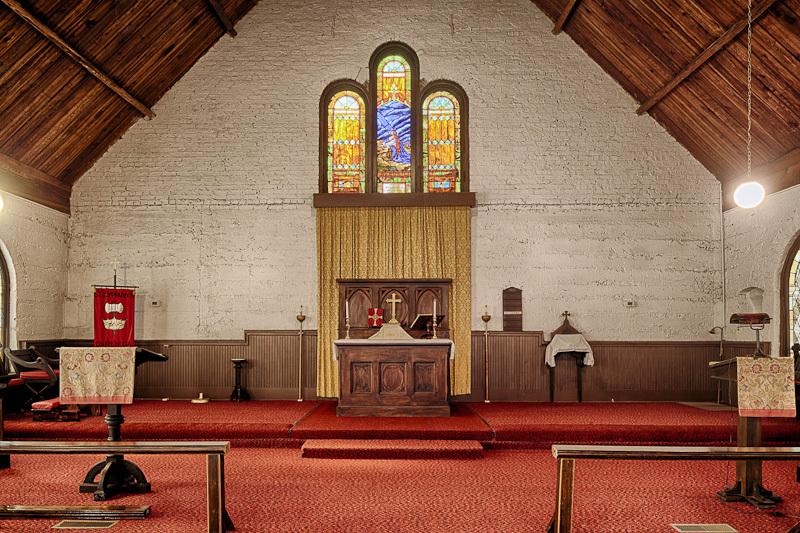 Located in the quaint little village of Darien, St. Cyprian’s is one of those rare Episcopal churches that serve the African American community. It has a very interesting story that starts with Darien itself. The story of Darien is a fascinating one and has its beginnings in 1735, shortly after Oglethorpe established Savannah in 1733. Oglethorpe was concerned about protecting Savannah from incursions from the French and Spanish and consequently, the Salzburgers were brought in from Austria to protect the northern approaches and established the town of Ebenezer, 30 miles north of Savannah, in what is now Effingham County. To protect the more vulnerable southern approaches he sent two of his lieutenants to recruit “warrior farmers” from the west coast of Scotland, and they did just that. These Highlanders and their families set sail from the west coast of Scotland on October 18, 1735 on the Prince of Wales for the three month voyage. They disembarked at the mouth of the north branch of the Altamaha river on January 19, 1736 and thus began the settlement of Darien, named in honor of the Scots who attempted the ill-fated colony at the Isthmus of Darien in Panama. One would never guess that the little village of Darien – population less than 2,000 – is the second oldest settlement in Georgia outside of Savannah. It also has five, yes five, very historical churches. The oldest of the churches in terms of founding date is the First Presbyterian Church of Darien, the “Cradle of Presbyterianism” in Georgia, having been established by Scottish Highlanders who settled this town in January, 1736. It was many years before any other denomination began to flourish as the Highlanders were all staunch Presbyterians. The St. Andrews Episcopal church was established in Darien in the early 1840’s, and by the late 1840’s the Rev. Thompson Smith worked much among the colored people, giving them afternoon services on Sundays at the different plantations. By 1856, the communicant strength at Darien rose to 37 white, 54 colored, total 91. The Episcopal church was well represented by both whites and blacks but the Civil War would soon change all of that. On June 11, 1863 a catastrophic event occurred that was to change Darien forever. According to the local history ‘Darien was invaded, looted, and burned to the ground on June 11, 1863 by Union troops, which consisted mainly of black soldiers commanded by two white officers. Col. James Montgomery is blamed for the pointless destruction and was later relieved of his responsibilities. The other officer was 25-year-old Col. Robert G. Shaw, who died about a month later during a famous assault on Battery Wagner on Morris Island, which guarded the southern approaches to Charleston harbor. The movie “Glory” tells the story of Shaw and the burning of Darien. Because of this unnecessary conflagration, most of Darien’s records were lost, and very little of the antebellum Darien exists. The Civil War devastated the South, and ended the plantation culture that depended on free labor from slaves and access to capital’. After the war the famous Butler Plantation across the river came under the leadership of the Rev. Dr. Leigh who had married the daughter of Pierce Butler, the founder of the plantation. According to the history,’ Soon after his arrival at Butler Island in 1873, the Rev. Dr. Leigh also began a project which would provide a colored church in Darien. He obtained plans for the construction of the new black church and called it St. Cyprian’s for the martyred African Bishop. The blacks from Butler’s Island and Darien did the work themselves, and it was completed in 1876?. 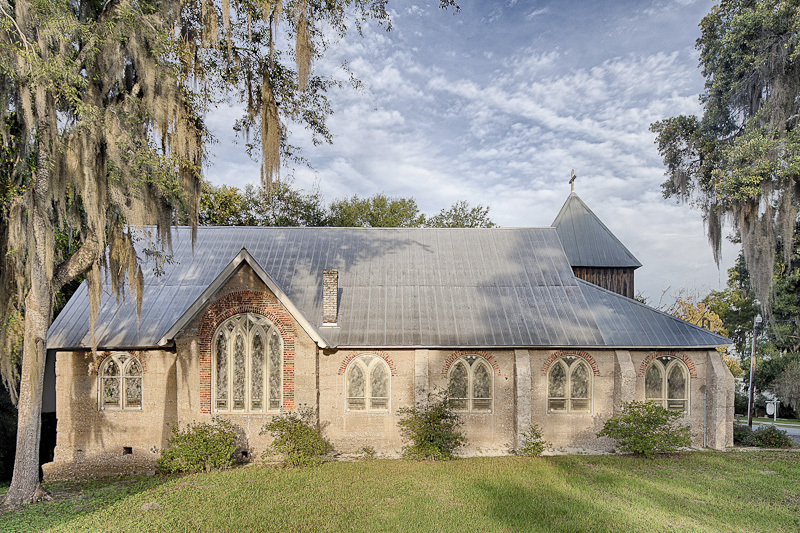 One of the features of this beautiful sanctuary is its construction of tabby, a common lowcountry building material used extensively in the 18th and early 19th centuries. The church is believed to be one of the largest tabby structures still in use in Georgia. 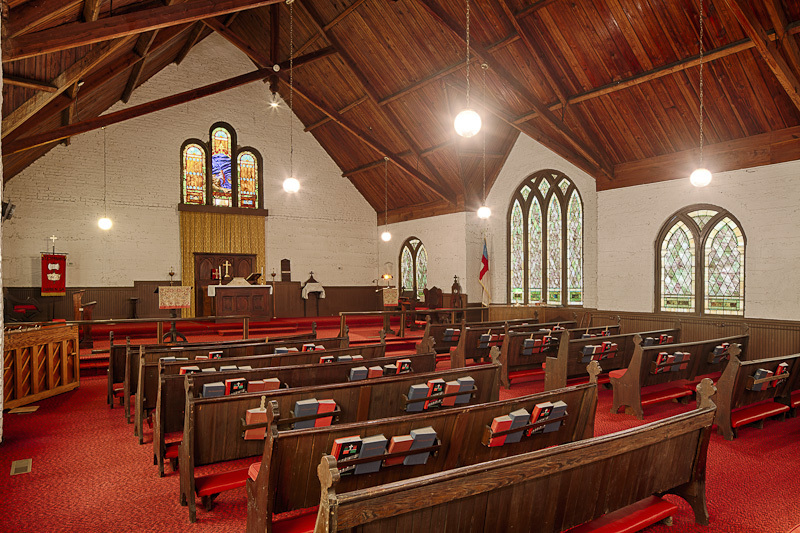 There are not many black Episcopalian churches in Georgia and certainly not one with a storied history and tabby construction. 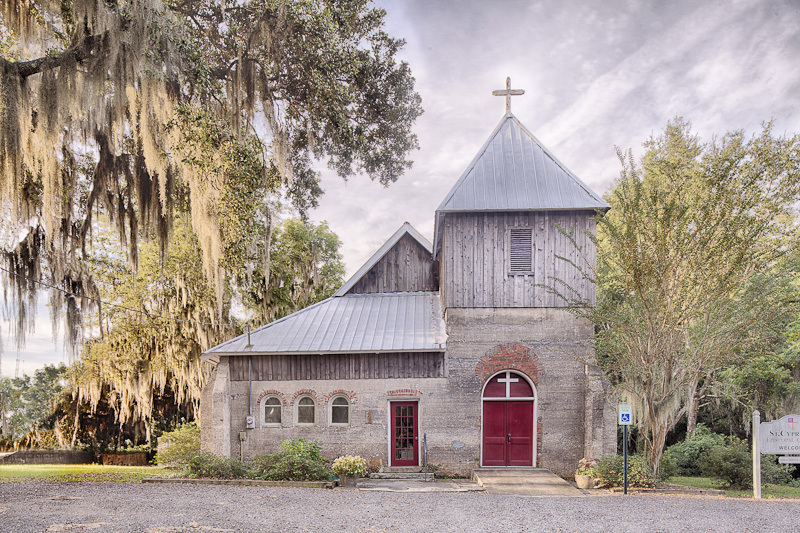 A visit to St. Cyprian’s and the quaint village of Darien should be high on your list of low country destinations. You are looking at one of the most unique and historic black churches not just in Georgia but in the United States. The building is designed and constructed in a Romanesque Tabby Revival style. Regarding its unique appearance, according to a study by Taylor P. Mathis (2011), money for the building was secured by the Rev. James Wentworth Leigh, with construction funds coming from England, Philadelphia and local citizens. Reverend Leigh was British and, indeed, spent most of his time in England. But he had a vision for the black community of Darien in the aftermath of the Civil War and he ‘obtained plans for construction of a church for the colored people of McIntosh County’. Thus the design of this church clearly has English, not early American, roots. The original 1876 structure was damaged by a hurricane in 1896 and then again, about two years later, when struck by a tidal wave. 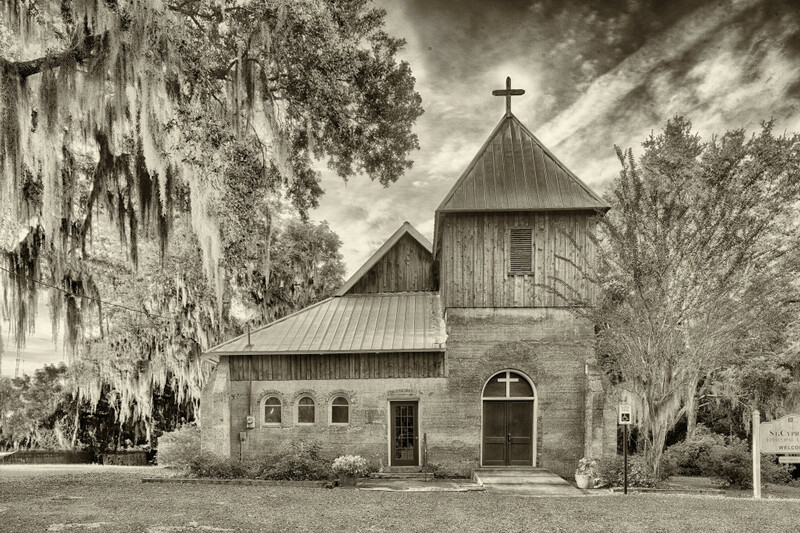 Repair and restoration of St. Cyprian’s was completed by the turn of the century. This detailed view of the entryway of the church provides us a closer look at just how the brick and tabby were used in its construction. Tabby serves as the primary load bearing material. But, when decorative and structural forms such as doors, window arches and frames are called for, brick can be employed to achieve the form desired. This structure features masonry (brick) arches… Roman style over entrance doors and segmented over secondary doors. You will later see that the sanctuary windows are a curious combination of Romanesque arches segmented with Gothic-style, tablet stained glass windows. Please note at the corner the tabby pilasters which are reminiscent of Gothic buttresses. This unique structural feature, seldom seen elsewhere, is used throughout the entire building. Lets talk about tabby, the coarse, resilient building material you are seeing in this view of the rear, northeast corner of St. Cyprian. Many think tabby is an indigenous material common only to low country Georgia. Think again. Tabby is an ancient building material with origins dating to 4,000 BC. That era is at least 4,200 years before the death of Saint Cyprian, the namesake of this church who died 1,800 years ago! The tabby we are familiar with has Mediterranean roots, particularly Spanish, i.e. 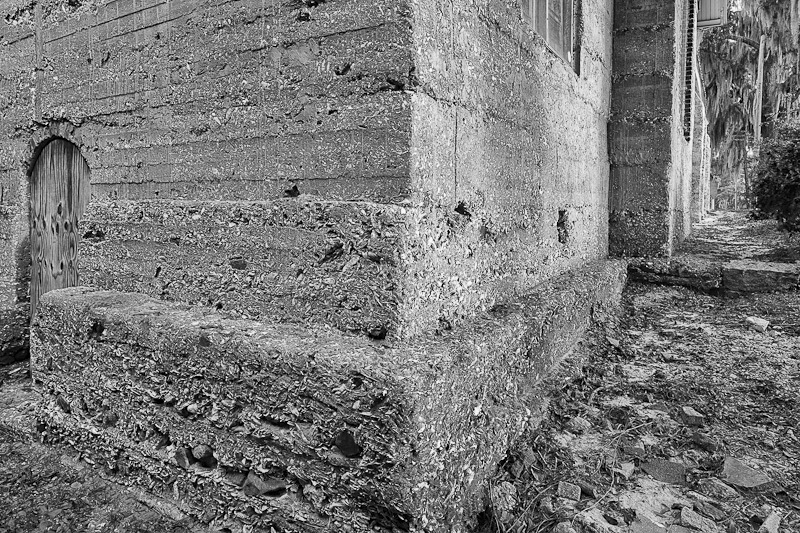 “tapia” or “rammed earth”. Tabby is made from sand, lime (procured from the burning of oyster shells), untreated, spent oyster shells (aggregate) and water. It was used extensively in the 17th and 18th centuries along the Southeastern US coast and then experienced a “revival” in the last quarter of the 19th century. St. Cyprian’s would probably be one of the last major structures built in Georgia using tabby as a primary construction material. As you can see and feel via the photo above, the interior of the sanctuary is breathtaking. It would be well worth the visit to experience this view up front and personal. Once again, we see construction and design that reflects what was popular in England during this period. The pews are all original and decorated with a trinity wood carving topping off each end. The interior features exposed, modified scissor trusses that seem to float in the air and create a bright and open atmosphere. The roof support consists of heavy, coffered beams and heart pine wooden decking. The roof is galvanized tin, a product that was becoming more available and desirable in the last quarter of the 19th century. The leaded glass on the sides of the church are stunning and aesthetically spot on! We are told that they are of the highest quality, American made Paul Wissmach and Kokomo glasses. The present congregation carefully maintains and treasures all of these windows, just as they should. This view of the chancel, altar and pulpit area tells us so much. Regarding construction techniques, we are looking at the gable end and can clearly see how tabby was used up to the beginning of the gable but brick used to finish the wall to the peak. The high quality of construction is displayed in the fit and finish evident in the lovely wainscoting, ceiling moldings and roof wood treatments, along with the window frames. Finally, the decorative element provided by the Trinity windows above the pulpit is striking and effective. The Christ in Gethsemane scene employs an artful use of hand painting and brilliant color to draw the eye to the face. The matching side windows provide an appropriate accent. This view of the north side of the church displays St. Syprian’s at its eclectic best. 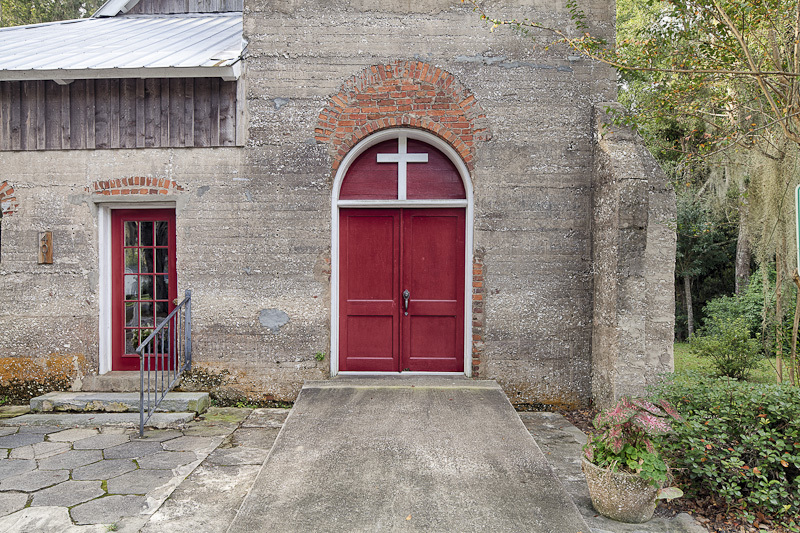 The exterior wall is flanked and supported end to end by the stout, tabby pilasters looking like Gothic buttresses. We see the tabby and brick work employed in a decorative tour de force. The Romanesque and Gothic brick arches embrace the spectacular stained glass windows. What a view this would be at night with the sanctuary fully lighted… the stained glass windows would produce a magical effect for someone on the outside looking in. This church is a tribute to the black community as well as to the whole community of Darien which has nurtured it since 1876. It has withstood countless hurricanes, a tidal wave, the Jim Crow period, a Great Depression and the gales and storms accompanying the civil right’s movement. It has proudly survived them all and remains an enduring piece of history… we hope it will for all to see and enjoy for many, many years to come.